And these are not just any artists - these are celebrated artists I their own right, Painters such as Shannon MaDonald, painter extroardinaire and designated World's Greatest Beatles Artist by none other than the Lord Mayor of Liverpool; Tom Murray's legendary The Mad Day: Summer of '68 photographs taken all over London in 1968; Rob Shanahan, known as the photographer to the stars of rock; German Pop artist Michel Friess the painter who loves to celebrate American iconic brands such as Mickey Mouse and Campbell Soup cans; sculptor Andrew Edwards whose 8 foot bronze sculptures of the Beatles leaving Liverpool are a major attraction even for Pau McCartney and James Corden; and lastly real Beatle's art work, namely Ringo Starr. Shannon likes large canvasses and will unveil one of her newest paintings titled Unfinished Paul, at the show, swell as other Beatles paintings both as a group and individually; Shannon's paintings are so realistic, at first, you think they are photographs. She has also provided all the artwork for the Hard Day's Night Hotel (126 works of art) and counts well-knowns such as Sylvester Stallone, the Spielberg's, Gene Simmons, illy Idol, Steven Tyler, Jon Voight, etc. as clients and fans of her work. Tom Murray just celebrated the 50th of his Mad Day shoot with the Beatles taken July 28, 1968 and recently released a book by the same title. 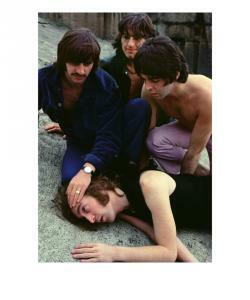 This legendary shoot was the last official shoot the Beatles her did as a group. Tom started his career working with Lord Snowdon at the London Sunday Times Magazine and became the youngest photographer (25 year old) to work for the Royal Family, Tom worked on both sides of the pond and photographed everyone from Royals to Elizabeth Taylor, Armani, Ralph Lauren, St. Laurent, John Schlesinger, John and Angelica Houston and many, many more. Recently, noted sculptor Andrew Edwards created a bronze sculpture of one of Tom Murray's photographs titled "Coming Apart" which shows Pal falling off a London roof top and the others holding on to keep him from going over. This photograph is also the core of Tom's book. The bronze machete of Coming Apart (18" in height) of the larger sculpture will be at the show as well as other Beatle sculptures including machete of the Beatles leaving Liverpool. The original 8 foot one of the Beatles resides in Liverpool and is a major tourist attraction, Andrews creations are all larger than life in size, so he creates the machettes to showcase the larger sculptures. The show will have an invitation only opening on the ebbing of November 15th at 6PM. Rick and Irene Rounick have been at the forefront of the contemporary art move for well over 30 years. They have an impressive roster of established and emerging artists from pop and contemporary culture including: Andy Warhol, Roy Lichtenstein, Keith Haring, Jean Michel Basquiat, and recently added celebrated graffiti artist Cope 2. As such, Soho Contemporary Art is a great source for art aficionado's wishing to add to their collections as well as new collectors. The Gallery is located on the lower East Side of Manhattan at 259 Bowery, Rick and Irene, always ahead of the trends, were one of the earliest galleries to move to the Bowery locale. The Rounicks can be reached directly at 646-719-1316.